In event #9, €100,000 Super High Roller total 76 has participated in the event out of which 10 levels are already finished. That number of players might just go up with late registration. Additionally, unlimited re-entry was open for two levels. In the final, 33 players through day 2 is Timothy Adams who was leading by the end of the day. 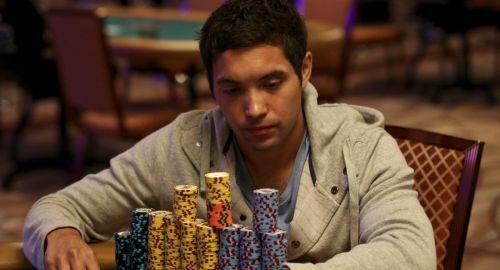 After beating Andrej Desset at the feature table, he went on to beat Jean-Noel Thorel to his victim list the second time. Admas said, “I ran good, I busted a few short stacks woke up with aces and kings when people shoved 10 big blinds so that was always nice and easy.” He commented that for the most part, it was a smooth sailing day as he just made hands and won pots with the showdown. Adams will be heading 12,960,000 as chip leader of the event. Climbing one step higher than in the €25,000 High Roller earlier in the festival, as Adams advanced from Day 1 second in chips. "To be honest, tomorrow's a new day at work," said Timothy Adams expressing his thought as he has been in a similar situation before. While other big stacks include Dominik Nitsche (9,515,000), Adrian Mateos (8,365,000), Tobias Ziegler (8,230,000), Steve O'Dwyer (7,390,000) and Stefan Schillhabel (7,275,000). Having won WSOP bracelets before on three on more than one occasion. Other players who have also been bracelet winners are Bertrand Grospellier, Niall Farrell and Fedor Holz. Jack Salter, Dietrich Fast and Anatoly Filatov, along with them are high roller regulars Richard Yong, Andreas Eiler and Winfred Yu were also eliminated. Both the players Thorel and Christoph Vogelsang fired four bullets in the Super High Roller, with Vogelsang finally making progress on shell four with 3,590,000 in chips. Strangely for a Super High Roller of this magnitude, the tournament kicked off on time with triple bracelet-winner Mateos and recent €25,000 Short Deck champion Mikita Badziakouski in the field. However, ironically the players got the message and the numbers swelled, with tournament officials contending admirably to manage the balancing of tables throughout all stages of the tournament. There were some remarkable hands on the feature table, with David Peters flopping quads against Steffen Sontheimer's pocket aces. Adams seemed to be totally in the zone and unstoppable through counts from tripling up with pocket jacks after both he and Renato Nowak flopped sets to the multiple eliminations of the unfortunate Thorel.